Hi there, my name is Danielle. Thank you for visiting my website. A little bit about myself. 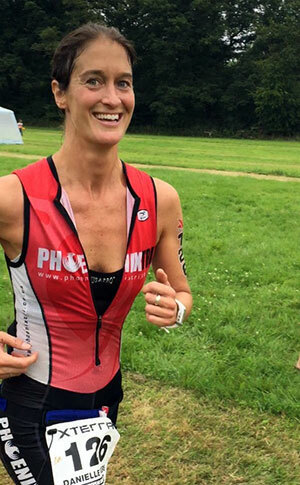 I am an endurance athlete and I take part in triathlons throughout the year. I achieved my goal of completing an Ironman and now I mainly stick to Middle Distance races. I enjoy searching for races that are different and are also that bit harder! I have been working within the fitness industry for over 20 years now. I am constantly trying to further my knowledge by attending courses as much as work allows. The sporting industry is constantly changing and I like to be kept updated. I understand that everyone has their own specific needs and I adapt towards this. I work with people of all ages and different abilities. I love to help people to achieve their own goals and objectives as this is important for me. It is just as rewarding for me to see good results as it is for them. I am based in West Sussex and I travel to people’s houses, work place or a suitable location in the West Sussex and Surrey areas rather than being based at a specific location. I find that a lot of my customers prefer this as they can train or have treatment in the comfort of their own home.